This book incorporates many of the exciting debates in the social sciences and philosophy of knowledge concerning the issues of modernity and post-modernism. 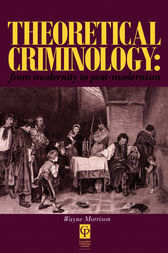 It sets out a new project for criminology, a criminology of modernity, and offers a sustained critique of theorizing without a concern for social totalities. This book is designed to place criminological theory at the cutting edge of contemporary debates. Wayne Morrison reviews the history and present state of criminology and identifies a range of social problems and large scale social processes which must be addressed if the subject is to attain intellectual commitment. This book marks a new development in criminological texts and will serve a valuable function not only for students and academics but for all those interested in the project of understanding crime in contemporary conditions.